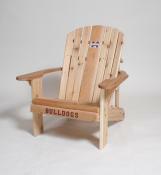 The official College Logos are color engraved on the center back slat and front seat slat of each of these classic, oversized Adirondack chairs. This rocker has an incredibly smooth rocking action and is oversized for maximum seating comfort. It is carefully designed so you'll be able to get in and out of it with ease. It's a beautiful piece of furniture that's engineered to last for years of outdoor gatherings with your friends. Expect to "glide your day away" in this oversized glider that is designed for maximum seating comfort. Top quality hardware and exacting construction methods ensure the smoothest gliding action. 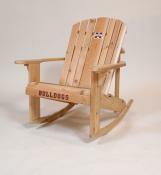 This glider will become the preferred seating choice at outdoor celebrations with your family and friends. Picture yourself seated in this handsomely-styled director's chair. We know you'll enjoy the view from "the top" as you relax in this oversized version of the classic director's chair. Use this chair at your outdoor bar or on the patio: either place you'll be "in charge" sitting almost three feet off the ground! Add the matching Director's Side Table to keep your beverage or reading material within easy reach. is the perfect, portable perch for your Tailgates! You'll sit heads-above-the-crowd in your official chairs! These super comfortable chairs fold for easy storage and transportation. folds down to 13 x 47 for easy transport.